Silver Star originally created a T shirt for Jon Jones for his UFC 100 fight and now they have returned a second version of their signature T Shirt for Jon Jones for his TUF 10 Finale fight against Matt Hammil. Jon “Bones” Jones is one of the more exciting Light Heavyweight fighters in the UFC with his super explosive power in the octagon and currently boasts an impressive 9-0 MMA record. 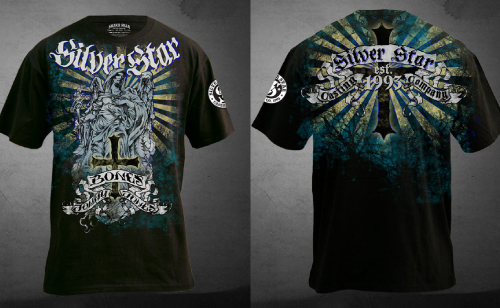 The second version of Jones’ Silver Star Shirt has a gold and blue pattern on the front and back with the popular Silver Star style, of course.